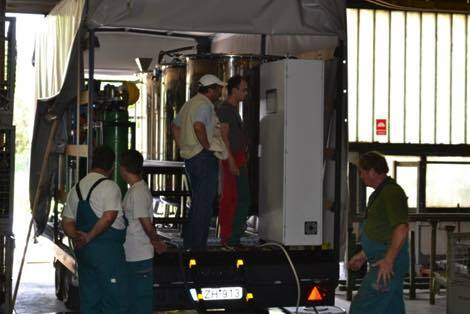 The end product of the procedure is an nZVI sol (suspension of Fe0 nano-particles) with pre-determined concentration, which – due to the added stabilizing substance (cellulose) – does not aggregate or react immediately with oxygen in the air. 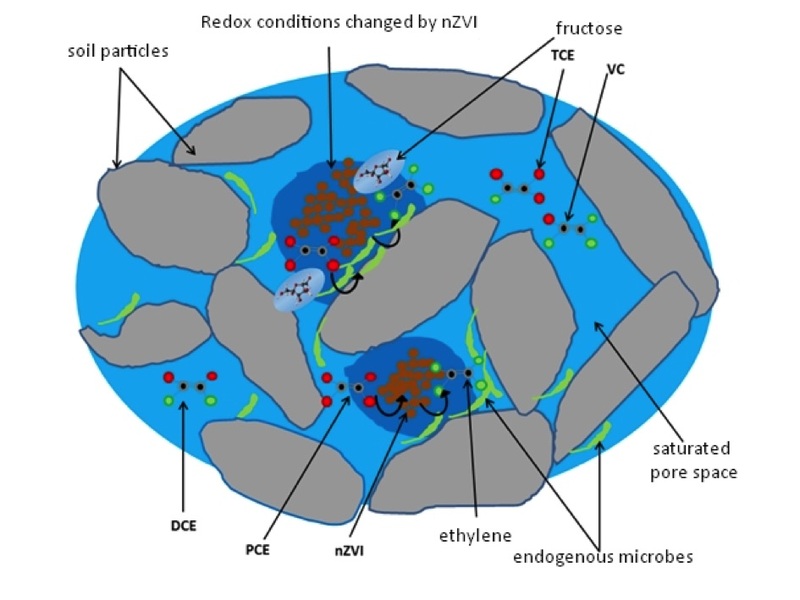 Nevertheless, delivery should happen in a closed system, immediately after production to allow the nZVI to exhibit reactivity in the pore space. 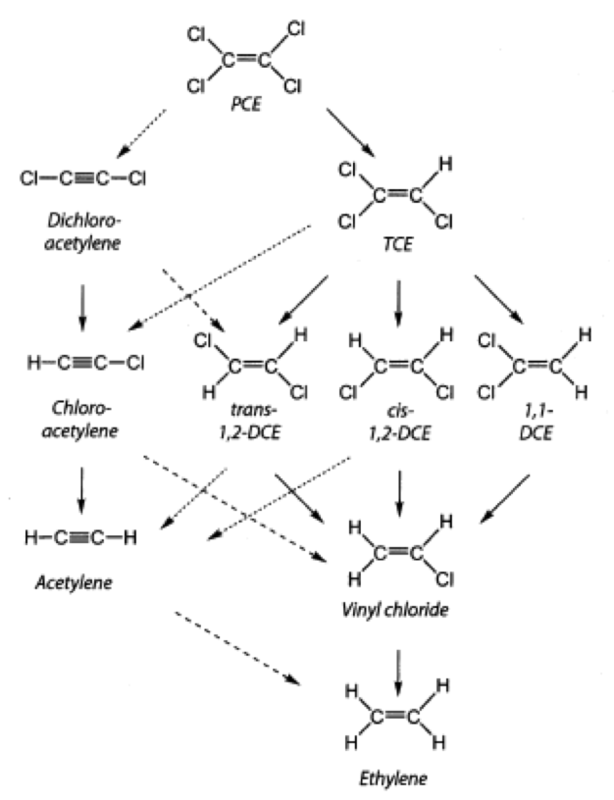 Wherein the original components (PCE – perchloroethylene or TCE – trichloroethylene) will be formed into DCE – dichloroethylene or VC – vinylchlorid by substitution of the separating chlorine atoms with hydrogen atoms in subsequent steps. At the very end of the process, the above CAH compounds will be formed into end products (ethylene, acetylene) that are completely harmless to the environment. This process is typically characteristic of microbial dechlorination. Anaerobic (reductive) dechlorination requires anaerobic environment, the presence of an electron-donor compound (hydrogen source), and the presence of all microorganisms necessary for the breakdown of the whole sequence. Wherein PCE, TCE or DCE components are formed into the end product in a single step rather than forming intermediate compounds. 70-90% of nZVI interferences take place via β-elimination. nZVI applicability is tested with laboratory tests followed by field tests in each case. 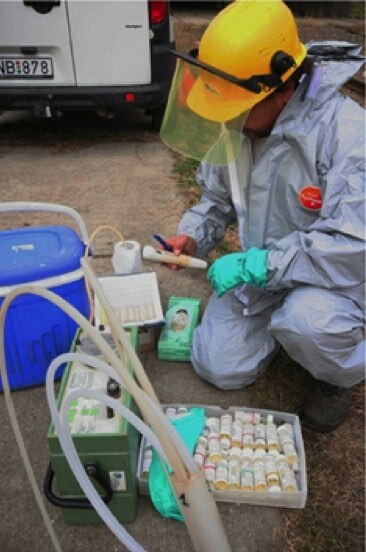 These tests are necessary to determine the duration of the nZVI remediation, the concentration and amount of the nZVI to be used, as well as the spatial and temporal density of injection. 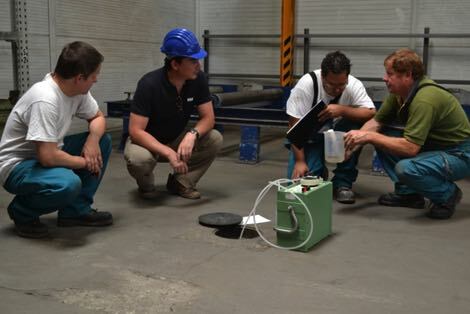 For field tests, CMT (Continuous Multichanell Tubing) sampling wells and low-flow sampling technique are preferred in order to ensure the most representative samples possible. It is essential to use the appropriate technology for the injection and to have detailed information of the geological structure. 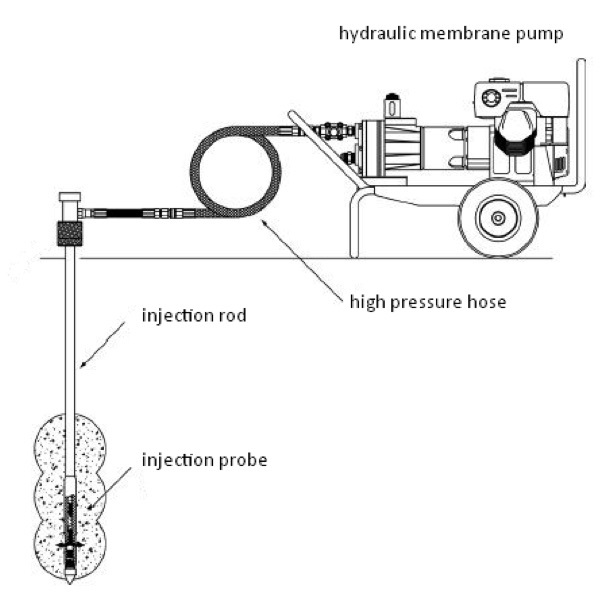 Delivery into the pore space is performed using high pressure pumps via injection probes pressed with DP (Direct Push) technology. The deepness of injection is positioned based on the results of preliminary CPT (Cone Penetrating Test) probes. 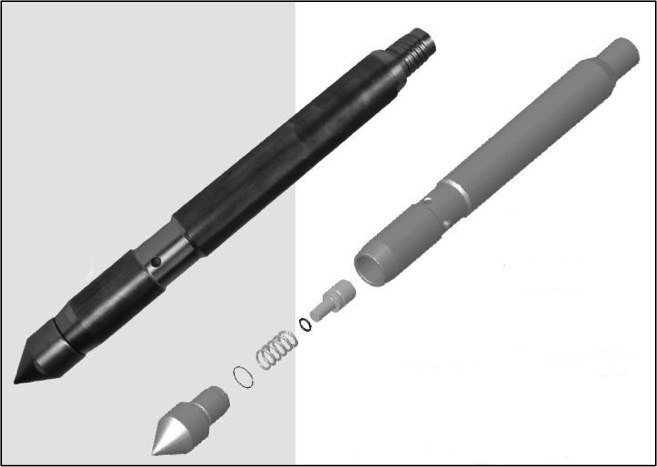 The GeoProbe Systems© injection probe we use is a tool equipped with a spring-loaded valve, with the opening pressure ranging between 1,5 – 4 bar. The valve prevents the injection probe from clogging while the uniform rods and the pressing technique provide for the appropriate tightness at the injection cone. At present, we are able to inject reagents in 30 m of depth into non-consolidated, sedimentary (clay-sludge-sand-gravel) soil or aquifer. Due to kinetic reasons, chemical reduction can only be effectively conducted at high concentrations of CAH (> 1000 µg/L), therefore, it should be combined with bioremediation/bioaugmentation technology (so called anaerobic dechlorination), wherein dechlorination is performed by CAH-specific endemic or exogenous bacteria under ideal conditions (anaerobic, reductive microbial environment, presence of electron donor compounds). This creates advantageous conditions for hydrogenolysis after β-elimination. Bacteria utilize CAH compounds as carbon sources and perform dechlorination in presence of so called electron donor compounds (HRC – Hydrogen Release Compound) in an enzymatic reaction. Reductive environment is ensured by the nZVI delivered which keeps ORP (Oxidation Reduction Potential) permanently under 100 mV. Hydrogen release compounds – typically simple sugars breaking down into organic acids (e.g. fructose), fatty acids (e.g. vegetable oil) are injected in a separate phase, with consideration to the nZVI action time and area. The resulting simple organic acids (lactic acid, formic acid, propionic acid, butyric acid) can be directly utilized by dechlorinating bacteria. ISCR remediation combined with in-situ bioremediation is a complicated process requiring continuous and frequent monitoring and injection. There are also considerable needs for instruments since production and injection require special equipment (these are available in our company or at cooperating partners). 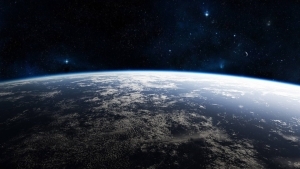 Nevertheless, the investment will pay off since in-situ methods do not produce waste, there are no unmanaged spaces left (spaces under buildings can also be processed) and the chemical (ISCR) or the combined technology can be much faster than the traditional methods based on physical principles (e.g. groundwater exploitation / stripping). 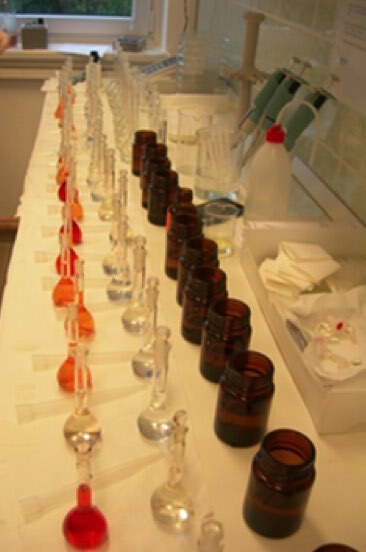 Anaerobic dechlorination as a supplementary technology is capable of handling contaminations that are stuck in the low permeability layers and refilling (matrix diffusion). In these cases, HRC is delivered directly (e.g. splitting of layers) or indirectly by the diffusion of HRC substances. 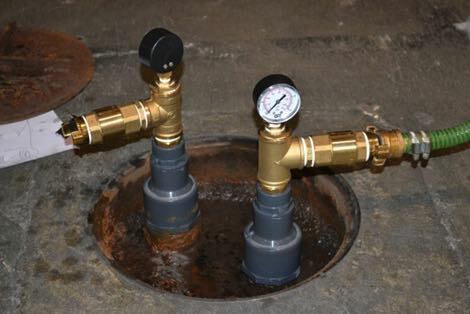 After remediation is finished, original conditions can be easily restored since the injection probes are temporary. The injection technology can also be applied in operating manufacturing plants since injection requires little space and can also be mobilized if required.